The Barton Springs Salamander (Eurycea sosorum) is a small (1/2" to 3" long), obligately aquatic, paedomorphic (retaining juvenile characteristics, such as gills, throughout its life) salamander that is found only in the Barton Springs segment of the Edwards Aquifer and its contributing zone. Although some of the first specimens of the Barton Springs Salamander were collected in 1946, the species was not formally described until 1993. The salamander was given the taxonomic name, Eurycea sosorum, in honor of the citizens of Austin, who initiated and passed the SOS (Save Our Springs) Ordinance in 1992 to protect the Edwards Aquifer. The Barton Springs Salamander occurs in all four of the springs, collectively known as Barton Springs, in Zilker Park. This includes Parthenia Spring in Barton Springs Pool, Eliza, Old Mill (Sunken Garden), and Upper Barton. 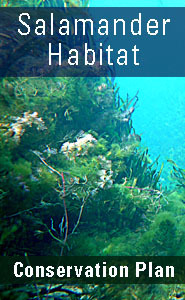 Click here to learn more about monitoring, habitat, and evolution of the Barton Springs Salamander. 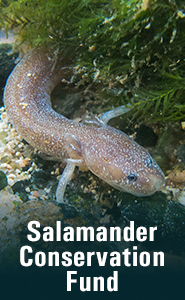 The Barton Springs Salamander is an endangered species and protected by the provisions set forth in the Endangered Species Act.